The countdown to Christmas continues at pace and my kitchen has been busy. First up Mincemeat. I love the stuff but have never made my own up until now. However I'm told that once you do you'll never go back to shop bought. I used Delia's recipe. Very straightforward, coring, peeling and finely chopping the apples took the longest. Fantastic smells when it was cooking in a low oven. 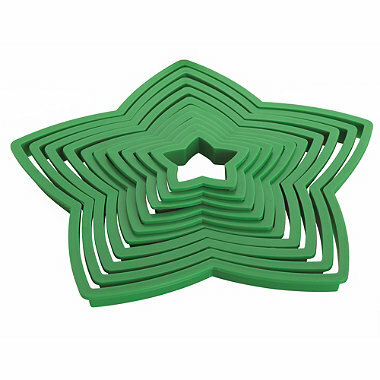 This melts the suet and stops the apples from fermenting. Plenty of brandy to finish it off. I'll definately be using some to make Mincemeat Muffins but first some mincemeat pies with a twist. I spotted these on the front cover of the Co-Operative Food Magazine. I can't resist a supermarket freebie mag. The pastry incorporates orange rind and juice and hidden under the stars is the twist. A cream cheese/icing sugar combo reminiscent of carrot cake topping. A warning with regards to the recipe. It states to use the juice of an orange to combine the pastry. I used only half and it was rather sticky at that so go cautiously. I made these to bring along to the final session before Christmas of a "Feast of Fish" evening class I'm currently attending. We all donned our festive pinnies, drunk mulled wine and made Fish Pie (in the freezer for Christmas Eve) to the musical accompaniment of Mr Buble. My warm pies went down a storm. The cream cheese works really well and I was impressed by my first attempt at mincemeat. The remainder have gone in the freezer for now. My friend C made a Star Biscuit Tower for a festive gathering a couple of years ago and since then I've fancied giving it a go. An invitation to Drinks and Nibbles at friends was the perfect excuse. I bought the set of cutters from Lakeland. £4.99 for ten which seemed a good price as they can also be used for other projects. I've already used the smallest cutter to make Zimsterne and a slightly larger one in the mince pies above. I followed the vanilla biscuit recipe on the back of the pack which worked really well. It's quite a soft dough so definitely needs chilling before rolling. You need to be careful when cooking the stars as the different sizes take different times to cook. I baked them on silicone parchment. There was plenty of dough so I made some snowflakes with the remainder. Now the tricky part. Icing and assembly. I used Silver Spoon All-In-One Royal Icing Sugar and probably made the mix a bit too runny. All started out well but once my star tower got taller and the icing below hadn't had time to set it began to slip and slide rather precariously. The end result was rather more Leaning Tower of Pisa than I would have hoped for but it tasted great. I would definately make it again but use thicker icing and give myself more time and assemble it in parts. Edible sparkly stars also from Lakeland completed the effect. I had spotted Reindeer Beer (aka Reinbeer) on Pinterest and knew I would have to make them at some point during the festivities. Very easy to do with brown pipe cleaners wrapped round the bottle top and red pom poms and googly eyes hot glue gunned on to the bottle. Super cute and a real talking point. Well worth doing if you are bringing a six pack anywhere this Christmas. I'm hoping lots of you were inspired by my Give Blood Get Teacakes post and have been giving the best gift you can this Christmas. I mentioned then the Christmas Pudding Teacakes that I'd spotted on The Things She Makes blog. Boy and Girl were keen to give these a go and rustled up a batch. They each got one for playpiece and the rest I took to a friend's for a post School Christmas Show coffee. They were a huge hit and lots of the Mums are now planning to rustle up their own batch. My final festive creation for now has an even more tenuous foodie connection than my usual offerings. 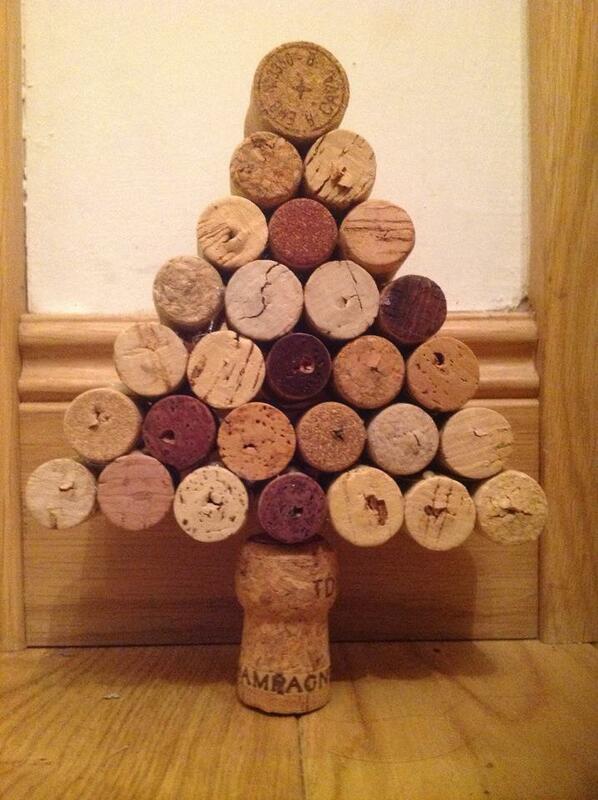 A picture paints a thousand words so here's my new hand crafted Christmas tree. Bottoms Up!